MINA, Saudi Arabia (AFP) - A stampede killed at least 717 people and injured hundreds more at the haj in Saudi Arabia on Thursday, in one of the worst-ever tragedies at the annual Muslim pilgrimage. The stampede, the second deadly accident to hit the pilgrims this month following a crane collapse in Mecca, broke out in Mina during the symbolic stoning of the devil ritual, the Saudi civil defence service said. Bodies could be seen in piles, surrounded by discarded personal belongings and flattened water bottles. In some areas rescue workers laid bodies in long rows on stretchers, limbs protruding from beneath white sheets. The civil defence service said it was still counting the dead, who included pilgrims from different countries, and that at least 863 people had also been hurt. Iran said at least 90 of its citizens died, and accused Saudi Arabia of safety errors. But a Saudi minister blamed the pilgrims themselves, saying they had not followed haj rules. “Many pilgrims move without respecting the timetables” set for the haj, Health Minister Khaled al-Falih told El-Ekhbariya television. Saudi Crown Prince Mohammed bin Nayef, who chairs the kingdom’s haj committee, met senior pilgrimage officials in Mina and ordered an investigation, the official Saudi Press Agency reported. The findings will be submitted to King Salman “who will take appropriate measures", SPA added. The King, in a live speech broadcast by Saudi-owned al-Arabiya television, said he had asked for a swift investigation into what he described as a painful incident. The stampede began at around 9am local time (2pm Singapore time), shortly after the civil defence service said on Twitter it was dealing with a “crowding” incident in Mina, about 5km from Mecca. Interior ministry spokesman General Mansur al-Turki said the stampede was caused when “a large number of pilgrims were in motion at the same time” at an intersection of two streets in Mina. “The great heat and fatigue of the pilgrims contributed to the large number of victims,” he said. Temperatures in Mina had reached 46 deg C on Thursday. A Sudanese pilgrim in Mina said this year’s haj was the most poorly organised of four he had attended. “People were already dehydrated and fainting” before the stampede, said the pilgrim who declined to be named. People “were tripping all over each other", he said, adding that a Saudi companion had warned him that “something was going to happen”. After the incident, helicopters patrolled overhead and ambulances crowded the streets rushing the injured to hospital, AFP reporters said. At one facility, a steady stream of ambulances discharged pilgrims on stretchers. It was one of the worst incidents to hit the haj in nearly a decade. The street on which the stampede happened, Street 204, is one of the two main arteries leading through the camp at Mina to Jamarat, where pilgrims ritually stone the devil by hurling pebbles at three large pillars. Thursday’s ritual was taking place at a five-storey structure known as the Jamarat Bridge, which cost more than US$1 billion (S$1.42 billion) to build, and which was used during earlier pilgrimages. Almost 1km long, it resembles a parking garage and allows 300,000 pilgrims an hour to carry out the ritual. The faithful had gathered until dawn Thursday at nearby Muzdalifah where they chose their pebbles and stored them in empty water bottles. They had spent a day of prayer on Wednesday on a vast Saudi plain and Mount Arafat, a rocky hill about 10km from Mina, for the peak of the haj pilgrimage. It was not immediately clear if the stoning ritual at Mina would continue as planned until Saturday after the stampede. The ritual emulates the Prophet Abraham, who is said to have stoned the devil at three locations when he tried to dissuade Abraham from God’s order to sacrifice his son Ishmael. At the last moment, God spares the boy, sending a sheep to be sacrificed in his place. The world’s Muslims commemorated Abraham’s willingness to sacrifice his son by slaughtering cows, sheep and other animals on Thursday. Figures released on Thursday by the official Saudi Press Agency said 1,952,817 pilgrims had performed this year’s haj, including almost 1.4 million foreigners. Foreign embassies were working to identify and assist their citizens caught up in the stampede. There was little immediate information on the nationalities of the dead, though officials in Turkey said at least 18 of its citizens were reported missing. In Saudi Arabia’s Shi'ite rival Iran, supreme leader Ayatollah Ali Khamenei said “improper measures” and “mismanagement” by Saudi authorities were responsible. “The government of Saudi Arabia must accept the huge responsibility for this catastrophe,” state news agency IRNA quoted him as saying. At least 90 Iranians died in the tragedy. Foreign capitals sent their condolences, with Washington calling the stampede “heartbreaking”. “We join you in mourning the tragic loss of these faithful pilgrims,” US National Security Council spokesman Ned Price said. The world’s 1.5 billion Muslims were on Thursday marking Eid al-Adha, the Feast of Sacrifice, the most important holiday of the Islamic calendar. The haj is among the five pillars of Islam and every capable Muslim must perform it at least once in a lifetime. In the past the pilgrimage was for years marred by stampedes and fires, but it had been largely incident-free for nearly a decade following safety improvements. Preparations for this year’s haj were marred when on Sept 11 a construction crane collapsed at Mecca’s Grand Mosque, Islam’s holiest site, killing 109 people. 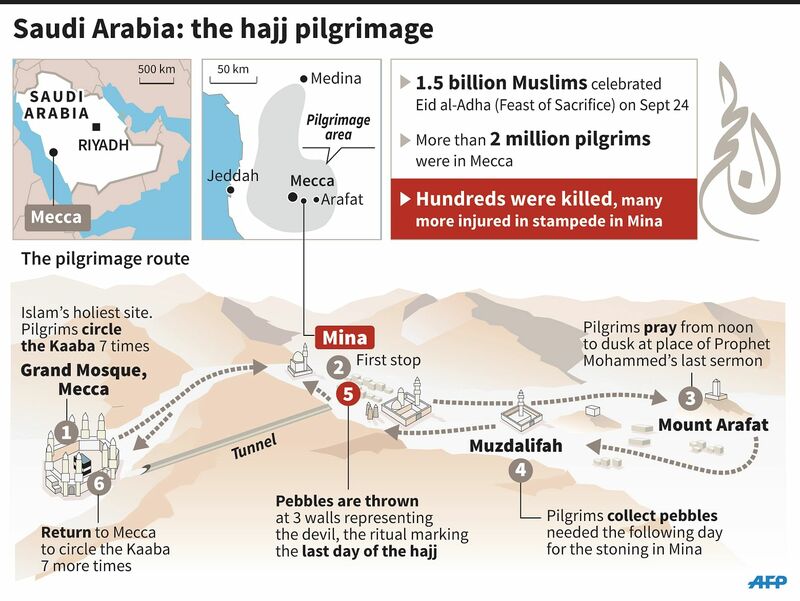 In January 2006, 364 pilgrims were killed in a stampede during the stoning ritual in Mina. The pilgrimage, the world's largest annual gathering of people, has been the scene of deadly stampedes in the past, as well as other disasters including tent fires and riots. However, massive infrastructure upgrades and extensive spending on crowd control technology over the past two decades had made such events far less common. Thursday is also Eid al-Adha, when Muslims slaughter a sheep. It has traditionally been the most dangerous day of haj because vast numbers of pilgrims attempt to perform rituals at the same time in a single location.